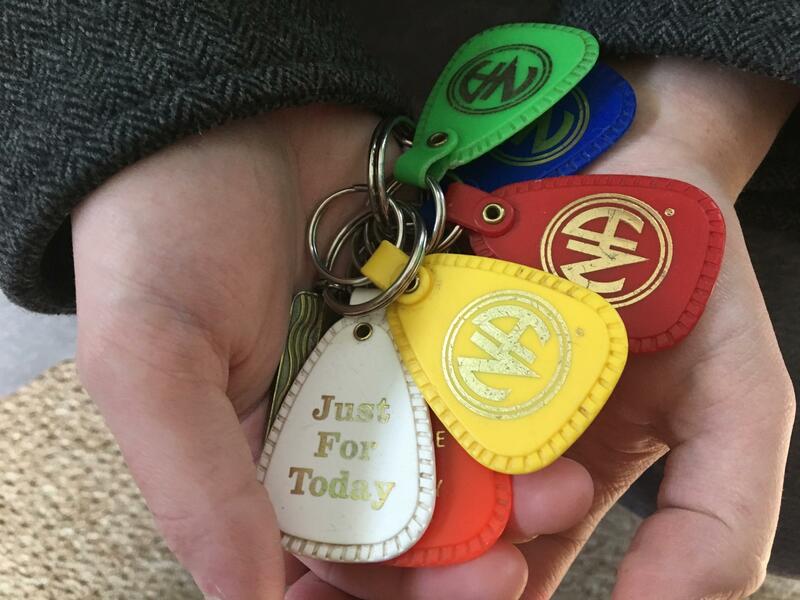 Joseph Schoepplein holds tags he's collected from Narcotics Anonymous meetings that represent how long he's been clean. Cape Cod has one of the highest number of sober houses per capita of any region in the state, a result of the draw of well-known addiction treatment centers like Gosnold. But the high number of sober homes can make relationships with the community uneasy. This is the final part of a three-part series examining the pressing need for sober houses, their importance in the addiction-recovery journey, and the challenges they can pose for communities. All the stories can be heard here. Michael McGonigle is a sober house inspector for Gosnold, and his job is to check sober houses in the region. On one particular day, he was heading out to inspect out a newly opened sober house in Mashpee. The house is on a quiet, residential block with well-kept lawns. It's a white two-story house that looks like it could have a family living in it. "These houses look very very nice," he said. "Usually sober homes don't look this nice from the outside." He also noted that the houses were set fairly close together, and that the residents would have to be mindful of the noise they make. Inspections by a Gosnold representative are optional for a sober house. In fact, any inspection is optional, because the sober house industry isn’t a medical service, and therefore isn’t very highly regulated. But McGonigle said the man who runs this sober house asked for an inspection because he’s trying to do things the right way. McGonigle has some advice. "If you want to have a good reputation, you have to be a good neighbor," McGonigle said. "When you come into the driveway, turn your radio down, don't be outside at midnight screaming. We already have a stigma against us, so if we can be the best neighbor we can, we've got to do that." During the inspection, he toured the house, making note of how many beds are in each room and where Narcan is kept. He also asked the owner why he wanted to open the sober home, and what the house rules will be. "What's the price? Do they have to go to outpatient? Is a certain amount of sobriety time required?" he asked the owner. He noted the answers in a notebook. If the inspection goes well, Gosnold will add the house to its database of sober houses it refers patients to after completing treatment. But for neighbors, having a sober house open up on your block isn’t always a welcome event. Loretta Croft and her husband have lived in East Falmouth for over 30 years and knew the neighborhood before a sober house opened across the street. She said she remembers what the house had been like before it was converted into a house for those coping with addiction, ten years ago. "This was a private residence, just like our house. But eventually they moved away, and the house came up for sale, and nobody told us it was going to be what it is today," she said. She added that the constant streatm of different men in and out of the house can take a toll on the block. "You just never know who's living in that house, you know? You gotta protect yourself more than you did eleven years ago," she said. But she was also careful to say that she hadn't had any trouble personally with the house across the street. In fact, police records show that activity at many sober houses in Falmouth peaked in 2016 and 2017, but have tapered off since the advent of voluntary certification. These days, a typical house may have around 1-3 police calls a year, and Croft said she doesn’t see police that often. "I feel blessed that I haven't had a lot of problems with them," she said. Richard Winant, a board member of the Massachusetts Alliance for Sober Housing, said that in some ways, he didn’t think the Cape was an ideal location for such a high number of sober houses. "One of the things we advise people when they're considering opening a sober house is: number one, is it near public transportation?" he said. "And number two, is there a reasonable amount of jobs in the area?" He said the isolation of the Cape, particularly in the winter, can be bad for addicts in recovery. But Michael McGonigle with Gosnold disagreed. He believed sober houses open on Falmouth because treatment is available there, and sober houses are part of that journey. "I think it has a positive effect on the community, because if there wasn't a place for these addicts and alcoholics to go after treatment down here, where would they be?" McGonigle asked. "They'd be on the streets or in hotels, or they'd be overdosing." According to Gosnold, a new sober house in Falmouth is opened about once every three-to-six months. "[People] might think there are too many, but you can't really tell us no, we're trying to help people," McGonigle said. The home he inspected in Mashpee is expected to open in the next few weeks. According to the house manager, there are already people looking to move in. This is the final part of our three-part series on sober houses on the Cape. Sober houses are places where addicts can continue their recovery after completing formal medical treatment. Falmouth has one of the highest number of these homes per capita of any town in Massachusetts, in part due to the presence of the addiction treatment center Gosnold. On a sunny spring day, Joseph Schopplein was riding in a car with his boyfriend, on their way to get his monthly Vivitrol shot. Schopplein is from Mattapan, near Boston. But like many opioid addicts in the state, he’s come to Falmouth for treatment at Gosnold, one of the largest recovery facilities in Massachusetts.